No matter the time of year, the Caribbean offers vacationers vibrant cultures and paradisiacal beaches, and no one can deliver the region like Royal Caribbean International. The cruise line with its world-renowned friendly and engaging staff and crew today unveiled its Bahamas, and Southern and short Caribbean program for the 2015-16 seasons. Independence of the Seas, Adventure of the Seas, Jewel of the Seas, Enchantment of the Seas and Majesty of the Seas will sail a variety of exciting itineraries from the easy-to-reach homeports of Port Canaveral on Florida’s Space Coast, Ft. Lauderdale and Miami, Fla., and San Juan, Puerto Rico. Whether for a short getaway or a weekend escape, guests will delight in exciting ports of call aboard some of the industry’s most innovative ships. Royal Caribbean’s 2015-16 Bahamas, and Southern and short Caribbean vacations are now open for booking, except for Majesty of the Seas, which will open next week. From May through Oct. 2015, Adventure of the Seas will sail seven-night Southern Caribbean itineraries from San Juan. This will be the ship’s first summer program from San Juan since 2009, and shifts from Sunday to regular Saturday departures. Vacationers have a choice among three itineraries, one calling at St. Maarten, St. Kitts, Antigua, St. Lucia, and Barbados, while the second replaces St. Kitts with St. Croix. A third itinerary calls at St. Thomas, St. Kitts, Aruba and Curacao. A one-time, six-night itinerary sailing on May 3 will call at Barbados, St. Lucia, Antigua and St. Maarten. Adventure of the Seas will then alternate two Southern Caribbean itineraries from Nov. 2015 through Apr. 2016. One seven-night, roundtrip sailing will call at St. Croix, St. Kitts, St. Maarten, Dominica, and Barbados, while the second include calls at St. Thomas, St. Croix, Antigua, St. Lucia and Grenada. A superior Southern Caribbean option for family vacations, Adventure of the Seas is among the Voyager class of ships, which first introduced the active cruise vacation. Guests can enjoy a wide variety of signature Royal Caribbean onboard amenities, such an ice-skating rink, rock-climbing wall, full-size basketball and sports court, and mini-golf course and the Royal Promenade, an interior boulevard that runs nearly the length of the ship and is flanked by restaurants, lounges and boutiques. Guests also can take in a world-class ice show in the Studio B ice rink or join in a street party and cheer on a Promenade parade in the Royal Promenade. For its part, Jewel of the Seas will join Adventure of the Seas at San Juan in winter 2015-16 and alternate two Southern Caribbean itineraries. Each seven-night, roundtrip sailing every Sunday will call at St. Thomas, St. Kitts, Aruba and Curacao, or at Barbados, St. Lucia, Antigua, St. Maarten and St. Croix. Jewel of the Seas features a dining and entertainment nightspot on deck 6, where guests can take in a delicious dinner in Royal Caribbean’s signature Chops Grille steakhouse or Portofino Italian Ristorante, followed by a round of billiards in the Safari Club’s self-leveling pool tables, live music and entertainment in the Serengeti Card Club or the Zanzibar Lounge, and a nightcap in the Congo Bar. Also in winter 2015-16, Independence of the Seas will sail roundtrip from Port Everglades in Ft. Lauderdale on four- and five-night short Western Caribbean itineraries. Vacationers can choose among a four-night itinerary, which calls at Cozumel, Mexico, or two five-night itineraries, one that calls at Cozumel and Belize City, Belize, or the other at Falmouth, Jamaica, and Labadee, Royal Caribbean’s private beach paradise on the north coast of Haiti. Independence of the Seas features a FlowRider surf simulator, a Royal Caribbean exclusive, and cantilevered whirlpools, as well as all the innovative onboard amenities found on the Voyager class. Year-round, guests also have a choice of the convenient Floridian ports Miami and Port Canaveral for short Bahamas cruises. Enchantment of the Seas will alternate a three- and four-night Bahamas itinerary, sailing roundtrip from Port Canaveral along Florida’s Space Coast. Guests will call at Nassau, The Bahamas, and spend a day at CocoCay, Royal Caribbean’s private tropical Bahamian island. 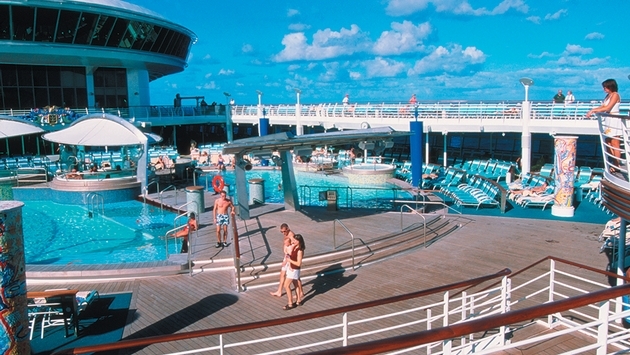 Majesty of the Seas also will sail three- and four-night Bahamas cruises, year-round and roundtrip from Miami. The three-night itinerary will call at Nassau and CocoCay, while the four-night itinerary also includes a call at Key West, Fla. Guests can enjoy exciting ports of call by day and enjoy spectacular Broadway-style revues, a variety of lounges and world-class gaming in the Casino Royale.